If you’ve ever seen a clematis that is one big mountain of tangled up stems, it’s almost enough to scare you away from growing them. But let’s take a look at why, when, and how these remarkable vines should be pruned and you’ll find it’s not as difficult as it seems. 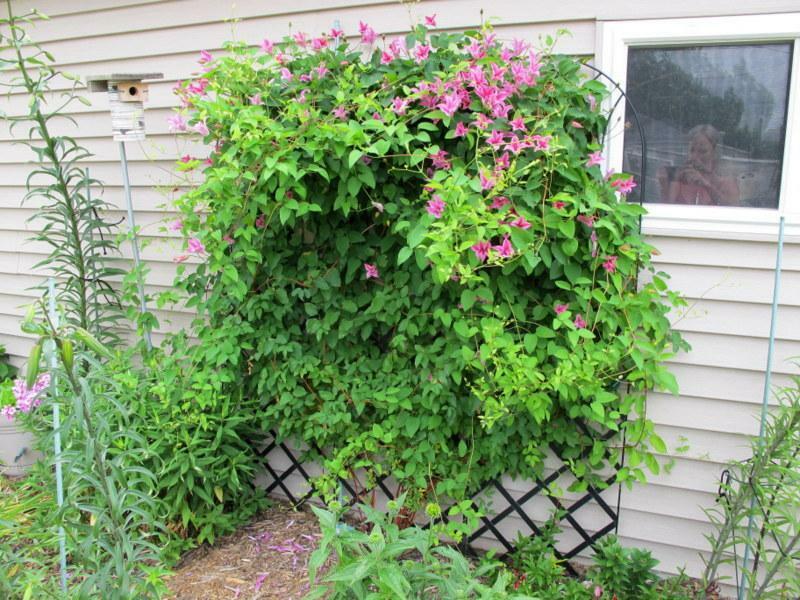 Properly pruning clematises will yield the maximum quantity of flowers by stimulating new growth. Pruning keeps the more vigorous vines under control. If not pruned, these large plants can literally tear down almost any support with their sheer weight. Keeping vines pruned brings flowers down to eye level rather than at a top of a tall plant. And if you have one of those mountains of tangled stems, pruning allows air and light to circulate through the leaves, reducing moisture that can cause diseases, and also tidies up the entire plant and displays the flowers to their best advantage. Clematises can live up to 50 years, so we want to take good care of them. It’s obvious, therefore, that all clematises need to be pruned. 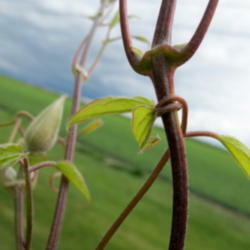 Almost everyone knows that there are three main groups of clematis, with three different pruning techniques. Don’t let this worry you because it’s not as difficult as it sounds. Example of a top-heavy vine (Duchess of Albany, Group 3). Incidentally, the rabbits chew this one down to the ground every year! Before we find out more about the three groups, there is something that every new clematis needs. Very early in the first spring after the year you plant them, all types of clematises need to be cut back to approximately 12 inches from the ground. I know, it’s really hard to do because everyone wants to see the flowers, but doing so will make the root system stronger and promote branching and new stems from underground, making the entire plant bushier and healthier. So that means that you’ll lose your flowers the first year on some clematises, but it also means that you’ll have many years of more flowers than ever. That sounds like a pretty good trade off to me! If you don’t do this, it won’t kill your vine, but you will be very disappointed when you end up with one or two wimpy vines with only a couple of flowers. Then you’ll probably end up cutting it back anyway and losing even more time in the process. Let's take a look at the three pruning groups. Every clematis has a pruning group assigned to it. If you purchase from a reputable nursery, that information will be included on the tag or on the nursery's website. If it isn’t, you can find the pruning group for each cultivar right here in our ATP database. Once you know the pruning group, it’s just a matter of following the information for that group. Group #1: These are the early-flowering and evergreen clematises, and the group also includes the alpina, cirrhosa, macropetala and montana species. They flower on “old wood,” which is growth from the previous year. Don’t go crazy pruning this group. Only a light pruning is needed. Any growth that occurs after pruning will be the stems that will produce buds for next year's flowers. 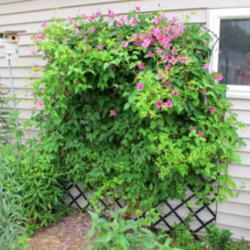 If you want these vines to spread quickly, only prune to remove dead or damaged growth. To keep vigorous growth under control, you’ll want to prune back a bit more. Try to avoid pruning any woody growth. 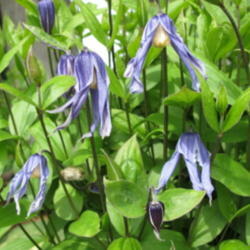 Group #2: Included in this group are early and mid-season large-flowering, double and semi-double clematis. These plants can be a little tricky because they flower on both old and new wood. The biggest flush with the largest flowers is in spring on old wood, followed by a smaller flush in fall, or even by a steady, small amount of flowers throughout the summer. When pruning, follow the vine down to a swelling leaf axle bud and prune right above it. Not a very good example, but if you look at the large vine right at the place where its branching out, you can see the leaf axil buds just beginning to form. Remove any dead wood, tidy the vine up a bit, and prune back to keep growth in check. If you have a big tangle of vines left from last year, try to untangle as many vines as you can after the first flush of flowers. If you can't untangle the vines, this is the time for a hard pruning, up to as much as 1/3 of each vine. If you do a hard pruning and your plant has double flowers, you may only get single flowers later this year. To keep a more natural look, stagger the length of the vines as you trim them back. Tie any new growth to supports to keep the plant open to air and sunlight. You’ll also want to remove any old leaf stalks remaining on the vines from last year. Plants in this group tend to get bare toward the bottom as they get older and do well with other plants around them, covering their bare stems. If they get too top heavy, they can be pruned back quite hard without damaging them. If you live in a very cold area, you’ll probably have to prune back farther due to damage by winter weather, or you may not have a choice at all if they die back to the ground. Notice the flowers all the way to the ground on this beautifully pruned clematis. Some suggest that Group 2 plants should be cut back hard every third year to avoid the tangled, old growth that can occur on the top of these plants. If you’re feeling adventurous, you can also do a special “second-year pruning” on these clematises, and on Group 1 plants as well. This is another hard pruning, but this time it entails cutting back the vines to about three feet from the ground. Again, this causes more new stems to grow from the ground and stimulates the vines to branch out. This isn’t necessary, but it will improve the appearance and health of your clematis in subsequent years. Group #3: Late large-flowering, late flowering species, and viticella clematises make up this group. They generally die back to the ground in winter in cold areas. If not, they respond well to hard pruning and can be cut back to about two feet tall. They usually get flowers on the last several feet of new growth and can be cut back even farther because they don’t bloom on old wood. Like the Group 2 vines, they will get bare stems toward the bottom as they age if they aren't cut back hard. Hard pruning sounds brutal, but it will reward you with lots of new growth and many flowers. As the new growth appears, tie it to supports to keep it looking its best. This is probably the easiest group to prune. 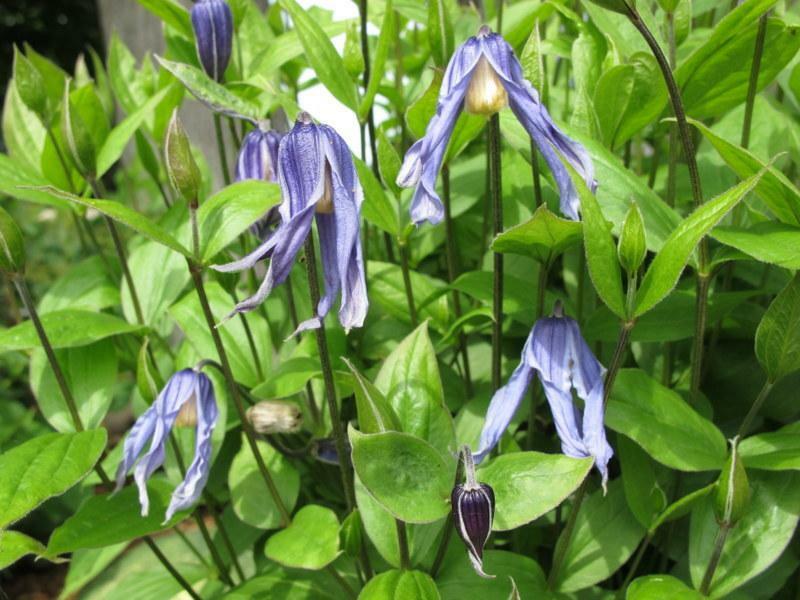 There are also clematises known as integrifolia or herbaceous clematises. These are non-vining perennials with a dense and somewhat sprawling habit. Although they can't attach themselves to a support, they can be tied to one or left to sprawl on the ground. These can be cut to the ground with your other perennials in late fall or early spring. Another reason to prune is to control wilt. 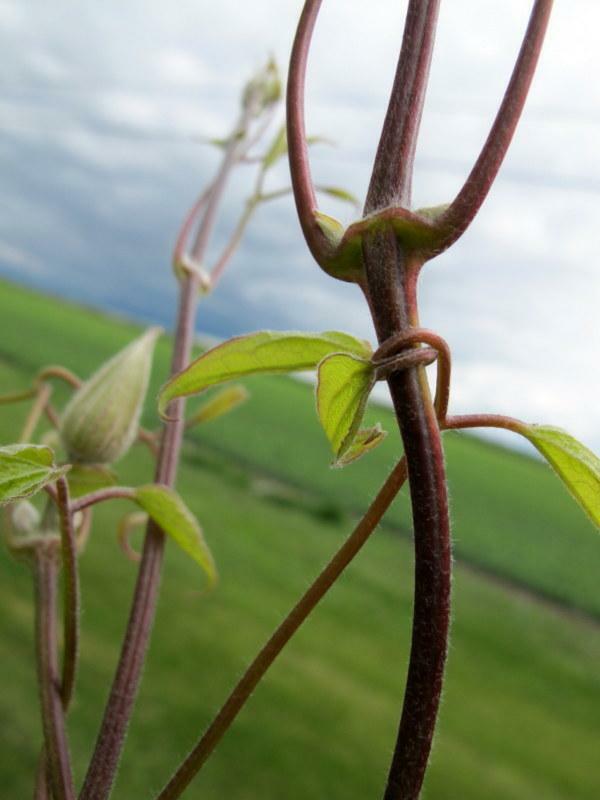 Clematis wilt occurs when the ends of the vine turn black and the vine, or even the entire plant, collapses. When this happens, cutting the plant all the way back to the ground will produce new growth. This is a radical pruning method but it will save your plant. As you gain more experience with the clematises you have, you’ll be able to recognize the three pruning groups from their bloom time. Group 1 blooms in early spring, Group 2 blooms on old wood in the spring and new wood later in the year, and Group 3 blooms on new wood late in the year. Now that you know how easy it is to prune them, your plants will be happier and prettier and will produce more flowers. Quite an impressive return on investment for only a few minutes a year!